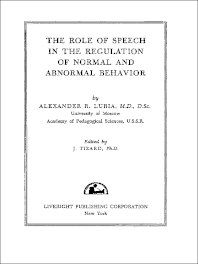 The Role of Speech in the Regulation of Normal and Abnormal Behavior examines the role of speech in the regulation of normal and abnormal behavior. Research findings on the regulatory role of verbal communication in ontogenesis and its disruption under various pathological states of the brain are summarized. The role of speech in the formation of mental processes is also discussed, along with the development of the regulatory role of speech. Comprised of three chapters, this book begins with a detailed account of the role of speech in the formation and evolution of mental processes in hopes of identifying the mechanisms underlying complex mental activities. It shows that speech enters integrally into the structure of mental processes and that it is a powerful means of regulating human behavior. The second chapter explores how the regulatory function of speech is formed and how it influences the formation of voluntary movements. The last chapter considers the relationship between speech and action as a criterion for identifying various forms of pathological behavior and for analyzing the compensation of the defects that result from it. This monograph will be of interest to psychologists.